Larry Slosberg and Michelle Marzynski, Joe Chovan, and I recently took CNYO on the road to Tully, NY to host a Girl Scout encampment at Camp Hoover. This was my fourth time at Camp Hoover at the behest of leader Libby Monte, who has always held authority over great and motivated scouts at the prior observing and lecturing events. Joe Chovan looking East (by looking North). Click for a larger view. An 8-ish arrival and setup found us coating ourselves in bug spray and tucking our pant bottoms into out socks over rumors of deer ticks in the vicinity (we all walked away unscathed. Everyone in shorts, who knows?). 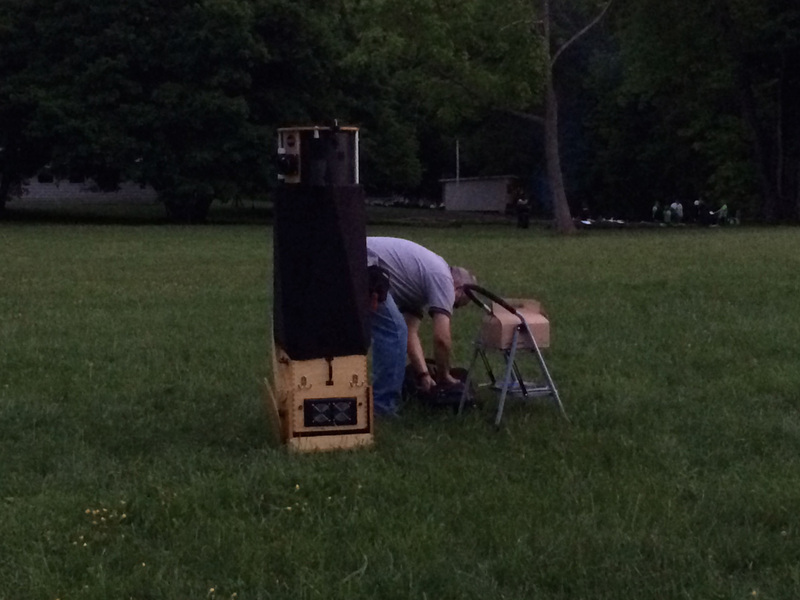 Amateur astronomy remains one of the great outdoor activities for the fashion unconscious. Larry Slosberg (mostly) at Zenith. Click for a larger view. 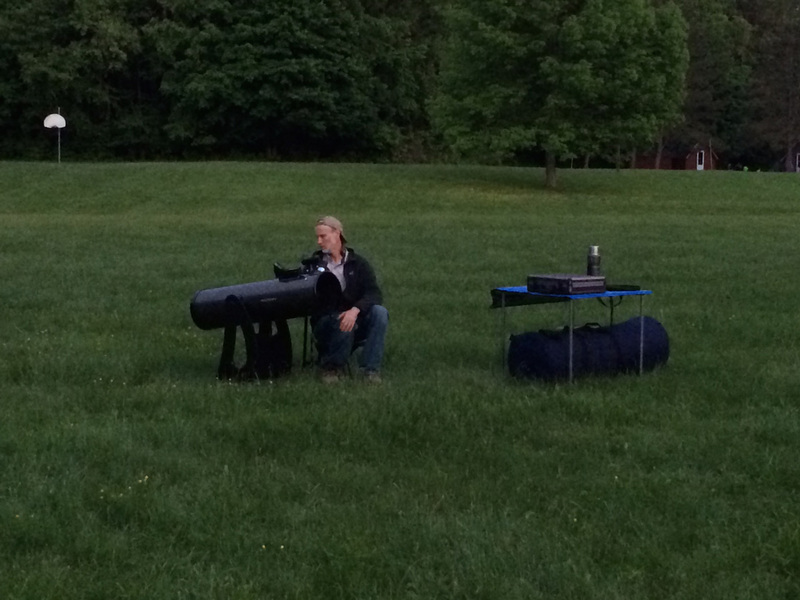 With a quick intro to the observing guidelines and how-to’s, all scopes were sighted on the first (and shortest-lived for the evening) target Jupiter as it began to set behind trees and tent. Despite a level of dusk cloud cover that would have scared away those with very short teardown times, all were treated to clear, reasonably steady skies not one-half hour later. * One Planet – In our case, Jupiter, Mars, and Saturn all made for easy targets (including weather bands, polar ice caps, and a Cassini Division that most everyone could pull out of the views). * One Star – Vega in Lyra (bright, shimmering stars and their colorized edges are fun to take in. It also lets you talk about scope design and how the shape of the spider supporting the secondary mirror produces the shapes you see over bright stars). * One Galaxy – M51, The Whirlpool Galaxy in Canes Venatici (this was also not easy given some of the outdoor lighting at Camp Hoover. M51 was one of my last targets so that the shorter line could spend a little more time trying to draw the nebulosity of the two cores with a medium-power (26 mm Nagler) eyepiece). We thank Libby and all at Camp Hoover for being gracious hostesses and we look forward to our return to the South-Eastern shore of Song Lake. We are always happy to accommodate Scouting groups as schedules and locations work out. Don’t hesitate to contact us through our CNYO Contact Page or at info@cnyo.org to check on scheduling possibilities.